"Salee" is a 35-metre motoryacht built in 1980 by the prestigious Italian shipyard Benetti, available for chartering through the company Yacht & Shipbrokers in Rapallo, Genoa. This is a displacing yacht built for long-range cruises and therefore equipped to be self-sufficient for long periods of time. 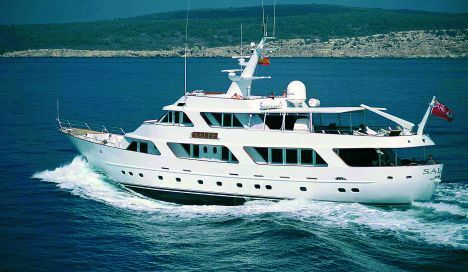 It has the classic design of round-stern classic ships over three decks plus sundeck. Interiors are elegant and enhanced by old-style, dark wood furniture, contrasting pleasantly with the pale carpet. "Salee" is fitted out to sleep eight, counting the owner and his guests with a further seven beds in the totally independent crew's quarters. 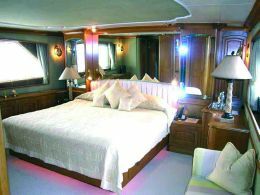 The owner's suite is located in the bows of the main deck and has a centrally placed king size, vanity, wardrobe and spacious bathroom finished in elegant Italian marble. 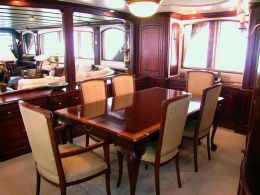 Aft of this there is first a roomy dining area, embellished with its mahogany table seating eight, accompanied by matching elegant chairs. 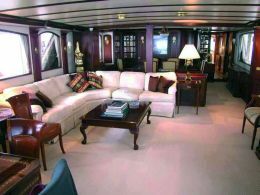 The main saloon, about 40 feet long, contains a long L-shaped sofa with coffee table, an antique card table and cabinet housing all the audio-visual systems. Outside, this deck offers plenty of room to stern for relaxing in the open air, with comfortable wicker chairs and cocktail tables. A stairway in the saloon leads down from the main deck to the guests' sleeping area on the lower deck. Here we find two VIP suites with en-suite bathrooms, while a third cabin, again with double bed and private bathroom is to be found on the upper deck where there is also the old-style control bridge. Externally the upper deck offers a huge leisure area in the shade of the extension of the sundeck, astern of which is located the tender, with its davit. The sundeck is obviously reserved for sunbathing with its roomy, comfortable layout. As it is a motoryacht mainly used for chartering, "Salee" has all the multimedia systems necessary for entertainment, as well as lots of apparatus for water sports. 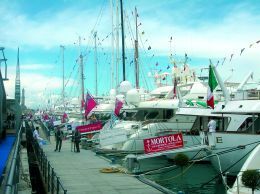 For further information about itineraries and availability please contact Mortola Yacht & Shipbrokers: via S. Michele di Pagana 32; 16035 Rapallo (GE); tel. +39 0185 234360; fax +39 0185 234352; website www.mortolabrokers.com; e mail info@mortolabrokers.com. Official maximum speed: 12 knots.